The latest Range Rover is lighter and more fuel-efficient than before, but it’s still a heavyweight tow car. We’re testing the high-spec Autobiography version powered by a 4.4-litre V8 diesel engine. With a 2.4-tonne kerbweight, huge reserves of pulling power and a well-appointed cabin, it should be one of the finest luxury SUVs you can buy. We want to see if the Range Rover can justify its near-£100,000 price tag. To do so, it needs to deliver exemplary towing, with top-notch stability and swift performance. It must also prove its credentials as a luxury car, with plenty of space, a comfortable ride and a very quiet cabin at speed. Read on for the full Practical Caravan Range Rover SDV8 Autobiography review to find out more. Even by the standards of big 4x4s, the Range Rover is a huge and heavy car. It may have slimmed down compared with the previous generation, but its kerbweight of 2410kg makes it one of the heaviest cars on sale. That gives an 85% match figure, as recommended for safe and stable towing, of 2049kg. The legal towing limit is 3500kg, and the maximum download on the towball is 150kg. These are such high numbers that few caravanners will get near them. We matched the Range Rover to a twin-axle Swift Challenger SE 645 with a Mass in Running Order of 1526kg. The 4.4-litre V8 engine brilliantly combines power and refinement. The power output of 334bhp is impressive, but it’s torque that counts when towing, and the Range Rover has mountains of the stuff. With 546lb ft from 1750rpm, there’s enough brawn to accelerate from 30-60mph in just 7.0 seconds, despite pulling a combined weight of over four tonnes. Some cars would struggle to match that without a van in tow. Having so much performance at your disposal makes towing seem effortless, and the eight-speed automatic gearbox works efficiently and unobtrusively to make the most of the V8’s reserves. Half throttle will hold speed up steep hills, and overtakes are quick and decisive. There’s also the benefit of four-wheel drive. This isn’t just useful when towing across a muddy field. It helps make good use of all that power on Tarmac, too, especially in wet weather. The Range Rover combines speed and stability. The air suspension is set up more softly than the Range Rover Sport’s and, although there’s little in it we’d say the Sport feels even more solid and unshakeable at high speeds. But essentially the Range Rover is a very secure car on motorway journeys. Even on a windy day it will tow straight and true for mile after mile. 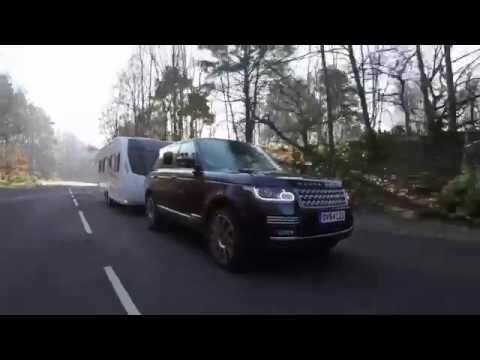 In an emergency manoeuvre, the Range Rover leans more heavily than a Range Rover Sport and doesn’t feel as agile, but Land Rover’s Roll Stability Control system stops body roll getting out of hand. There’s ample grip and the caravan follows the car obediently. The brakes are reassuringly powerful. A light touch on the pedal brings smooth and progressive deceleration, but hit the pedal in an emergency and there’s plenty of bite. We found that the Range Rover stopped from 30mph in just 10.1 metres. Hill starts are straightforward. With four-wheel drive and all of that pulling power, starting on a slope hardly seems to tax the engine at all. The electronic parking brake holds the car and caravan still even on steep gradients and releases smoothly. It adds up to one of the finest cars we’ve towed with. We’d rate the smaller Range Rover Sport even more highly, but we’re splitting hairs between two exceptional cars. Whatever caravan you pull behind it, we doubt you’d find the Range Rover wanting. The Range Rover impresses in everyday driving. It’s a hugely capable machine, with a breadth of abilites that few cars match. Off road, the Range Rover is superb, with a host of electronic aids to help the driver cope with obstacles. Land Rover’s Terrain Response system, which is controlled by a rotary control on the transmission tunnel, allows the driver to switch between different modes for the gearbox, stability control and other vehicle systems depending on whether the car is driven on mud, sand, rocks or Tarmac. Terrain Response helps the Range Rover go further off-road than most owners will ever venture. On Tarmac, the Range Rover is just as impressive, with a smooth and quiet ride thanks to the air suspension. Driver and passengers sit high above most other traffic, enjoying the comfort, calm and quiet. Having driven the cheaper 3.0-litre diesel, we reckon that there is no need to spend the extra on the 4.4-litre V8, since the smaller engine has plenty of poke. But we can see why buyers might want to spend the extra, because the performance is superb. The engine sounds great, too, with just enough V8 rumble without being intrusive. On country roads the Range Rover isn’t as much fun as a Range Rover Sport, which rolls less in corners, has a meatier feel to the steering and changes direction more readily. However, unless you’re really in a hurry, the Range Rover handles very well for such a big car. The Range Rover is five metres long and 2.22 metres wide (including the mirrors), which demands care on narrow lanes or when threading its bulk through narrow streets. The square shape and good all-round visibility make it easy to judge the position of the four corners of the car, though. The combination of off-road and on-Tarmac capabilities is what makes the Range Rover an exceptional car to drive. But even if you only experience what it can do on the road, this off-roader is as smooth and comfortable as any luxury saloon. Inside there’s wood, leather and polished metal wherever you look. The materials are traditional, but there are high-tech touches. For example, the speedometer and rev counter are displayed on an LCD screen. However, the touchscreen sat-nav looks dated next to the larger screens and crisp displays of some rivals. The driving position is more lofty than in many 4x4s, even with the seat on its lowest setting. Electric adjustment makes it easy to fine-tune the position, and on high-spec Autobiography models the seats have a massage function. Those in the rear seats are every bit as comfortable, with significantly more legroom than in most big 4x4s – an advantage of having five seats rather than squeezing in room for a third row. Air vents between the front seats and above passengers’ heads keep the back of the car supplied with chilled air. The boot has a good 550-litre capacity, but the split tailgate is a mixed blessing. The lower half gives you somewhere to sit and, say, pull on a pair of wellies, but it means it’s a long stretch to the end of the boot. What’s more, the boot floor is a long way from the ground, so any luggage has to be lifted high when loading. The rear seats fold all the way down at the press of a button. The Range Rover may not have the flexibility of some seven-seat 4x4s, but it is a very comfortable five-seater. Big 4x4s with prestige badges are expensive to buy, but even by these standards the Range Rover is a pricey car. The 4.4-litre V8 in Autobiography spec costs over £96,000, and it won’t take many options to push that the wrong side of £100,000. What Car?’s experts predict the Range Rover should be worth 48% of the new price after three years on the road, but that means a loss of more than £50,000. The new Range Rover may be lighter and more efficient than its predecessor, but it still drinks fuel at a swift rate. The official combined figure suggests 32.5mpg is achievable in daily driving, while we saw 21.9mpg towing on a mixture of A-roads, country roads and motorways. It’s no secret that the Range Rover doesn’t have a reputation for reliability to match that of the Toyota Land Cruiser, for example. However, Land Rover finished 14th out of 26 in the JD Power Customer Satisfaction Survey last year, suggesting that recent cars are much improved. Even so, there’s no getting away from the Range Rover’s high price or running costs. Clearly, the Range Rover’s price puts it beyond the reach of most caravanners, but for those with the means it’s one of the finest tow cars we can think of. The regular 3.0-litre diesel is powerful enough to tow a twin-axle caravan, but the 4.4-litre V8 adds extra punch. However steep the road, this engine always seems to have power in reserve. Stability is excellent. With such a high kerbweight and smoothly controlled air suspension, the Range Rover quietly but firmly puts the van in its place. There’s no nervousness, no hint of wandering, just solid, secure and stress-free towing for mile after mile. We found the Range Rover’s brakes almost as impressive as its mighty engine. They’re easy to apply smoothly in normal towing, but have real bite when needed, stopping four tonnes of car and caravan from 30mph in just over 10 metres. Without a van, performance from the V8 engine is even more vivid. Ride comfort is the equal of – or better than – any luxury saloon’s, with an ability to go off-road that few SUVs can match. Inside, the Range Rover is beautifully made, superbly equipped and very roomy for five. There’s lots of boot space, too. Unlike in many 4x4s, there’s no third row of seats even as an option. The Range Rover Sport ticks that box for Land Rover, as does the Discovery. There are better-value 4x4s, and some of them are parked next to the Range Rover in Land Rover showrooms. But it’s quite a car.